By Send2Press Newswire on January 17, 2012 in Finance, Men’s Interest, New Jersey, Press Releases, Sports and Activities, WALL, N.J.
WALL, N.J., Jan. 17, 2012 (SEND2PRESS NEWSWIRE) — Two NY Rangers fans who were attacked and beaten outside a Philadelphia eatery on January 2, 2012, after the Rangers vs. Flyers match up are about to receive the star treatment thanks to a business owner with ties to former team members. Peter Grandich, founder of Trinity Financial Sports & Entertainment Management Co., LLC, will host the two men, Neal Auricchio Jr. and Michael Janocko at the February 12th Rangers game. Grandich will treat the pair to a private suite that they will share with former Rangers Nick Fotiu and Ron Greschner. “Former Ranger and Trinity Financial board members Nick Fotiu and Ron Greschner both contacted me shortly after the beating incident in Philly asking what we could do to show support to these Rangers fans,” explains Grandich. “Having already secured a suite at the February12th game, I decided to invite both Neal and Michael to be my guest with fan favorites Ron and Nick and we’ve invited several other ex-Rangers,” Grandich says. He notes that he is also glad to see the Rangers organization invite the fans to a game later in February. “I felt especially motivated because of my involvement with current and retired professional athletes in the New York/New Jersey area and the concerns fans have of attending Philadelphia-based sporting events. I was most pleased to see not only how swiftly the Philadelphia police handled the case, but many Philly fans outraged by the attack,” Grandich adds. Auricchio, a new dad with a 3-month old baby, is a Woodbridge Police officer and Iraq war veteran. He received the Purple Heart for his service in Iraq. As a result of the unprovoked beating the two endured at the hands of Flyers fans as they were waiting for cheesesteaks after the outdoor Winter Classic hockey game at Citizens Park Bank, Auricchio is said to require surgery and the installation of steel plate under his eye to heal a fracture. Both men suffered head injuries, and Janocko also suffered an orthopedic injury. Grandich contacted the pair through friends in the NJ State Police to invite them to the Rangers vs. Capitals game and both men were thrilled to accept. “Meeting men listed on the list of All-Time New York Rangers Greats is a thrill for any Ranger fan. Meeting two or more at once in a private suite while watching the game? That’s a dream come true. I am happy to be able to make that happen for these two fans,” says Grandich. Trinity Financial, Sports & Entertainment Management Company offers a variety of services for individuals and small to mid-sized businesses. Additionally, through the assistance of co-founder and company consultant Lee Rouson, a former New York Giants running back and two-time Super Bowl Champion, Trinity Financial offers specialized services for professional athletes and entertainers. Peter Grandich is a member of the National Association of Christian Financial Consultants. His daily financial blog, The Grandich Letter, is read online by thousands of investors at www.grandich.com . The company is located at 2431 Atlantic Avenue, Manasquan, NJ. 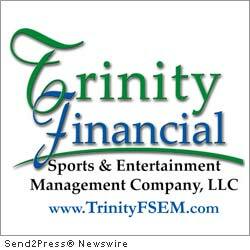 For information about Trinity Financial, go to www.TrinityFSEM.com .